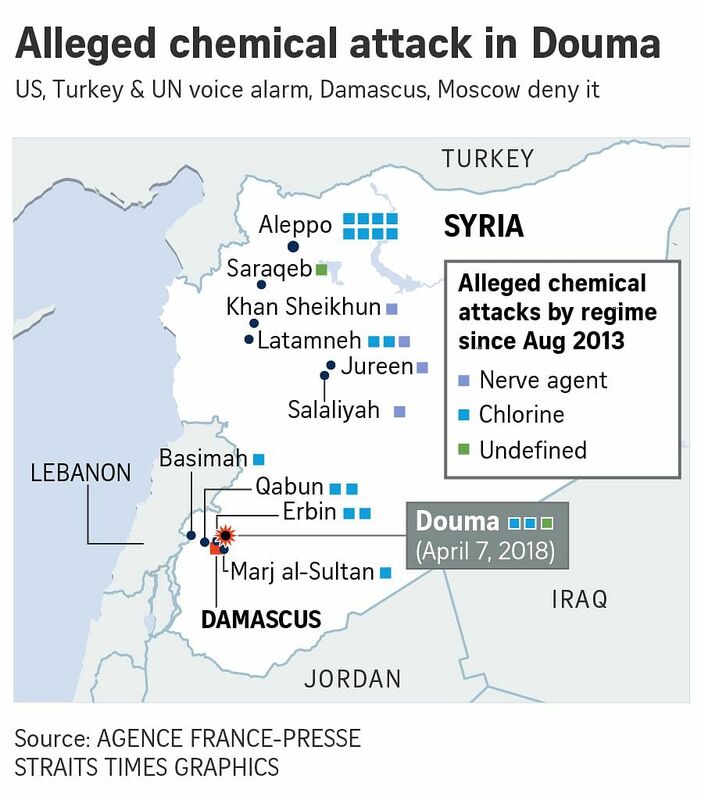 PARIS/WASHINGTON (REUTERS, AFP) - Suspected chemical attacks over the weekend killed at least 60 people and wounded more than 1,000 in Ghouta, a besieged rebel-held town in Syria, a Syria medical relief group said on Monday (April 9). The death toll is likely to rise, according to the Union of Medical Care Organisations, a coalition of international aid agencies that funds hospitals in Syria and which is partly based in Paris. “The numbers keep rising as relief workers struggle to gain access to the subterranean areas where gas has entered and hundreds of families had sought refuge,” the group said in a statement. The assessment by US authorities is that chemical weapons were used in Ghouta, but they are still evaluating details of the attack, US government sources said on Sunday (April 8). The determination was made with some degree of confidence, said the sources, who stopped short of assigning blame for the attack on Saturday, which medical aid groups said killed dozens of people in the town of Douma. The European Union said earlier that evidence pointed to Syrian President Bashar al-Assad's forces being behind the attack. French President Emmanuel Macron has also accused Damascus of "chemical attacks" against civilians in Douma in a call with US leader Donald Trump on Sunday, as international outrage mounts against the alleged use of the weapons. Trump and Macron vowed a “strong, joint response”, the White House said. “Both leaders strongly condemned the horrific chemical weapons attacks in Syria and agreed that the Assad regime must be held accountable for its continued human rights abuses,” a statement read after Trump and Macron spoke by telephone. “They agreed to exchange information on the nature of the attacks and coordinate a strong, joint response." Both leaders would coordinate their efforts at a meeting of the UN Security Council in New York on Monday. Trump has warned there would be a "big price to pay" after Saturday's attack, as rebels began evacuating Douma, the last sliver they held of their one-time stronghold Eastern Ghouta, under a deal with Syria's regime. "Damascus and its allies have denounced the accusations. Syria's White Helmets, who act as first responders in rebel-held areas of Syria, said "poisonous chlorine gas" had been used late on Saturday. In a joint statement with the Syrian American Medical Society, the White Helmets said more than 500 cases were brought to medical centres "with symptoms indicative of exposure to a chemical agent". France, which has repeatedly said evidence of chemical use in Syria could prompt military action, responded by calling for an urgent UN Security Council meeting on Monday.